The Blurb of the book says: Hexagon is racy, fast moving and a thrilling tale about Rahul Oberoi, an art thief whose great achievement was that he had never been caught.All that changed when he along with his girlfriend and partner Ria are apprehended during a heist. They are then taken to a top secret underground government facility where Rahul’s grandfather worked. In the middle of this facility is an ancient device made of stone, adorned with mysterious carvings. It is a gateway to six parallel dimensions and six different earths. They are then embroiled in a war waged by a violent race called the Moths and the fate of the six earths depends on the outcome of this war. About The Author: Ishaan Lalit is a Gemmologist, Pilot and Adventurer from a multi-cultural background. He is an avid traveller and observer of human behaviour. He lives in Delhi NCR along with his family and his three dogs. His first book ‘The Bracelet’ got good reviews by HT City and Pioneer but he was not content with that, hence he is all set to redefine Indian Sci-Fi with Hexagon. A book you won’t regret picking up from a book store. Be it a science fiction thriller, as those Hollywood movies, but a book from an Indian author, is an incredible work.“Hexagon” is about Rahul Oberoi and his girlfriend and partner in crime Ria. They both are art thieves and have so far managed to never be caught. However, their achievement is thwarted when they are caught. From there they enter a new world thanks to an ancient device with mysterious carvings and end up being caught in a war. It is a war that involves the six different worlds that exist in the different dimensions. This war is being waged by a violent race called the Moths and the fate of the six earths depends on the outcome of this war. Writing is brilliant but with a little sarcasm and almost innocent charm that causes you to be glued to it and lose all sense of time. 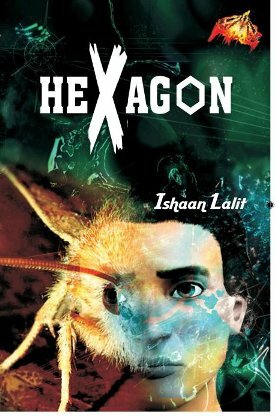 From the fascinating other worldly creatures in The Bracelet to the violent wars of different universes in hexagon , Ishaan Lalit is clearly trying to give his readers a ride, keeping them on their toes while letting his imagination run amok. Be it in any of the aspects right from the cover design and printing quality of the book to the content, Mahaveer Publishers and The author Ishan Lalit has worked on it, which is very evident when you will hold the book in your hands. A recommended book by Book Review Forum.